This 2 color contrast lightwieght fishing jersey is the perfect addition to your lineup on Tournament day. Available in Medium through 3XL. This professional style performance fishing jersey, features both the Bullet Logo on the chest and "Total Performance" down the sleeve. Made from quick dry, UV blocking material. Available in Medium through 3XL. This jersey is 100% polyester and fully sublimated. Features Bullet on the front and back with a boat wrapped around the jersey. This professional style performance fishing jersey, features both the Bullet Logo and the Mercury Logos along side the American flag on both sleeves. Made from quick dry, UV blocking material. Available in Medium through 3XL. This professional style performance fishing jersey, features both the Bullet Logo and the Mercury Logos on the chest and along the side on both sleeves. Made from quick dry, UV blocking material. Available in Medium through 3XL. This super clean Black & White professional style performance fishing jersey, features both the Bullet Logo and the Mercury Logos along side the American flag on both sleeves. Made from quick dry, UV blocking material. Available in Medium through 3XL. This lightweight tournament jersey is 100% polyester and provides quick drying and UV protection. These are hooded and feature the Bullet and the Mercury logo on the front and down the sleeves. This is a high quality Badger Sports, pro style jersey with sewn in black sleeve patches and fully sublimated artwork and lettering. It also has elastic cuffs to help your sleeve stay put when casting. 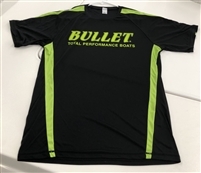 Has Bullet logo on front with the fish graphic, "Total Performance" on one sleeve, "Fishing Team" on the other. These long sleeve Colmbia PFG performance jerseys will keep you cool and protected from the sun and feature the Bullet logo on the front and back. Available in limited quantities in Red, White and Blue or Orange, Grey and White digital camo.